This is a great choice for the serious student, perfect spare for the gigging musician, or simply highly usable additions to any arsenal. Route for neck pickup under pickguard; excellent gigbag. Just the one colour available - that’s about it. Godin may certainly be better known for its innovative Multiac models, 5th Avenue semi-acoustics and a hugely eclectic catalogue of ‘world music’ electro instruments, but the company is no stranger to solidbody electrics and simple rock ’n’ roll machines. This new Summit SG is the latest in a line that has included models such as the short-lived (Godin sub-brand) Richmond Empire and Godin’s own-brand Core CT P90. Whatever the background, this Canadian-made Summit is exceeding well turned out for the money. From the packaging, the sturdy gigbag (with Velcro strapped neck support) to, obviously, the guitar, you get the impression that Godin remains far from a cynical box-shifting enterprise. This guitar might appear ‘low-end’, but there’s a huge whiff of quality and an aroma of class - and that’s before we even strum a chord. As we say, the inspiration might seem obvious and this is very much a ‘start-up’ electric, but as history has proved, Gibson’s Les Paul Juniors and Specials were aimed at the student and yet have powered many a big-selling band. It’s the same thing here, and in many ways the ‘cost-cutting’ elements such as the semi-gloss finish (the ‘SG’ in the name) of the slab body works in its favour, distilling the instrument down to the basics: a very workingman, gigging tool. The body outline is a classy single-cut design with a lower bout that hints at Fender, a rounded bass-side shoulder and a slightly slanting cutaway - there’s as much of the original Multiac, not to mention that Richmond Empire, in this outline as there is anything that ever came out of Kalamazoo. Godin invariably uses North American woods wherever possible in both its various acoustic lines and here on the electrics. Instead, then, of the time honoured all-mahogany you might expect, the 45mm-thick body is Canadian Laurentian basswood (named after its area of origin), while the neck is maple, despite the fact that its dark-stained smooth satin finish looks very different. The body is clearly two-piece and centre-joined, visible through the ’burst finish of this P90 model. It’s not particularly matched, but the visible basswood has a light wavy figure that certainly adds interest to the nicely ’bursted body face. The sides and back are black and there’s a slight ribcage chamfer that removes some of the slab feel, along with quite a large edge radius, played seated or standing. This wood choice also means the guitar is very nicely weighted. The neck adopts a well-shaped, quite full ‘C’ with approximate depth at the first fret of 21.3mm and 23.6mm at the 12th - very mainstream. Rosewood is the exception to the otherwise North American wood choice, and its classic 305mm (12-inch) camber matches the 629mm (24.75-inch) scale length. The mid-brown streaked ’board has simple cream dots with tidy fretting from a medium gauge (approximately 2.35mm wide by 1.2mm high). The 22nd fret sits right at the end of the neck, necessitating a slight fingerboard overhang under which the pickguard (a thick black and white five-ply plastic) tidily fits. Those frets are highly polished, too, although a little more rounding of the ends, and indeed the fingerboard edge, would just add a little extra to the feel. As to the neck construction, the heel on the P90 is black ’bursted. The headstock is spliced on, but higher than usual, just in-front of the two E string tuners. And don’t forget, Taylor uses a similar three-piece neck construction, as does PRS on its S2 Series and CE 24 and Silver Sky bolt-ons. The lip inside the treble cutaway - slightly thinner than on an original Les Paul Junior - also suggests that most, if not all, of the width of the neck fits into the body. Godin’s headstock proudly displays the country of origin and is another classy, classic design. We’ve criticised Godin before for adding an unnecessary number of brand logos to its instruments. Hey, maybe they listened: there’s just the headstock script logo here and a sneaky one on the dog-ear P90 pickup cover and the bobbins of the zebra humbuckers. Hardware is impressive, not least the Graph Tech ResoMax Sonic 1 one-piece ‘wraparound’ bridge. Graph Tech states it’s made from a “proprietary lightweight high-strength ResoMax alloy, that leaves each note dripping in tone and harmonics”. It also magnetically locks to the steel posts, so it won’t drop off while you’re restringing. But it’s the curved lozenge-like feel that’s impressive, along with the string anchor slot (you don’t have to thread the strings through a hole), and the very curved back of the bridge with no sharp angular edges to potentially damage the string, which can, of course, lead to premature string breaks. The bridge is pre-intonated, while overall intonation can be set with two small set screws as usual. Under the hand, it feels really good and offers a string spacing of 52.4mm with a radius of 305mm (12 inches). Godin has been using these tuners for some years now, and not only do they have a proprietary retro appearance, they boast an unusually high ratio (which means they are finer to tune) of 18:1 on the bass side and 26:1 on the treble. Whereas the classic Les Paul Junior’s dog-ear P-90 screwed directly to the body, the only height adjustment being the single row of pole pieces, here, as we’ve seen on previous Kingpin-equipped Godins, the pickup sits in a dog-ear sized cavity and is height-adjustable via the two outer screws. Finally, the output jack is the screw-in Tele barrel style. Functional? With a capital F. Sounds Acoustically, there’s a lively but not over-bright or honky response. This guitar doesn’t really need any dialling in, but raising that Kingpin P90, more like our reference ’57 Jr, seems only fair; likewise, the twin ’buckers. Having warmed up things with a variety of similar guitars - that Jr, a ’76 Guild S-90 and a modded Seth Lover-equipped Tokai Love Rock - the SG P90 holds its ground. It’s not quite as ‘big’ sounding as the vintage Gibson (it’s not alone there! ), but the character of the sound we hear is very similar with that addictive snarl and midrange peak, through a crunchy Marshall voice. It cleans up pretty well, too, although the tone cap might be a little excessive with the tone rolled fully back. A surprise for the armchair experts might be the roomy low-end response, perhaps at the expense of a slightly attenuated bite that sounds a little compressed compared with our Jr and a more Les Paul-like Knaggs Kenai - both, of course, much more expensive pieces. Overall, a slight treble lift seems to enhance what we’re hearing, especially when you roll back the volumes for cleaner, snappy, older blues voices or the nicely textured and bouncy mix. Conversely, there’s a solid thickness to the neck voice full up with some gain, while the bridge easily slips into cranked Foo Fighters territory with no effort whatsoever. Yes, it’s a simple recipe, but when it’s done this well it’s extremely tasty. Tuning stability out of the box is extremely good with the usual string stretching, as is the strapped-on feel and light weight. Aside from those slightly sharp fret ends and fingerboard edge, we’re struggling to find any negatives. This might be a start-up model from Godin’s expansive range, but it illustrates so much about the brand’s ethos. The use of North American woods (with the exception of the rosewood fingerboards), original body designs, modern-style electronics, innovative hardware, strap lock buttons, all wrapped up in an excellent gigbag, are typically positive attributes. It offers a highly usable take on the Jr/Special style with very tidy construction, classic style and highly usable sounds to match. 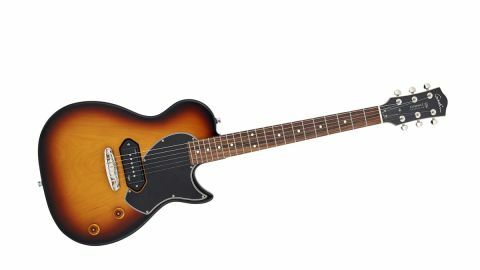 Yes, as we see increasingly, colour choice isn’t vast, the P90 model only being available in its classic ’burst, but it’s hard to knock what is a very tidy package. This is a great choice for the serious student, perfect spare for the gigging musician, or simply highly usable additions to any arsenal. Never played a Godin? Shame on you.